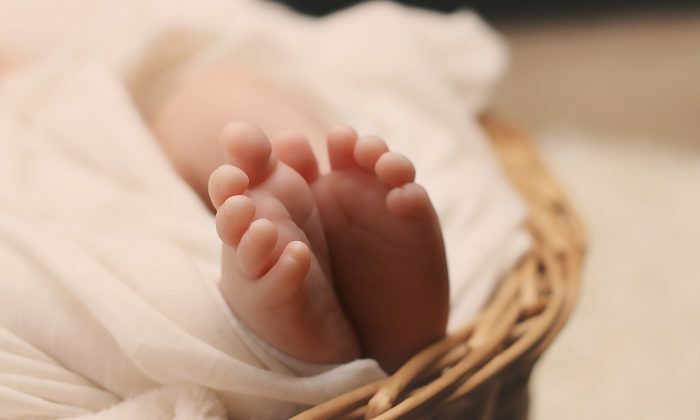 A British woman gave birth to her own grand-daughter at the age of 55, after acting as a surrogate for her daughter who was born without a womb. Emma Miles is legally the mother of her own granddaughter Evie, who was conceived by IVF. Her daughter, Tracey Smith, 31, had known since the age of 15 that if she wanted her own child, she would need a surrogate. She had no womb, but still had ovaries and fallopian tubes. Over the years, her mother had mentioned the possibility that she could act as a surrogate, but it wasn’t until Smith got married in 2016 that it became a serious prospect. Miles lost 84 pounds to get down to a healthy weight for the pregnancy, according to Wales Online, and moved over a hundred miles from her home in south Wales to be near her daughter. She gave birth by caesarian section on Jan. 16 to Evie, who weighed 7lb 7oz, reported the BBC. A 55-year-old woman has acted as a surrogate for her daughter and given birth to her child. Pregnancies after the age of 35 carry an increased risk of developing pre-eclampsia, a condition that can be potentially fatal for the mother or unborn baby. But Miles brushed away those concerns. Smith said that when scans revealed she had no womb it turned her world upside down. “I was heartbroken at the idea that I wouldn’t carry my own child. I’d always known that I wanted to be a mum, even at 15. “Straight after my diagnosis mum made an offer to do what she could to help. I knew that she meant one day she’d carry my child for me. “Over the years she mentioned it in passing but we never really made a firm plan. However, Smith was worried about using a surrogate. According to UK law, regardless of the babies genetic mother, the surrogate and her husband get automatic parental rights. “That felt like a huge risk,” she said. Some surrogates naturally develop a very strong maternal attachment to the newborn they have carried for 9 months, but Miles said that she only feels like a proud grandmother. IVF surrogacy has been around for only about 40 years, spinning off various legal paradoxes and challenges as it opens up the world of surrogacy to more people and creates new potential conflicts between different kinds of parents. For example, a surrogate mother from Texas called for a change in the law after the biological parents of the baby she carried told her to abort their baby—which she refused to do. Stephanie Levesque, who has been a surrogate mother three times, gave birth to a baby just days before Christmas on Dec. 21, 2017, at the Medical City Women’s Hospital in Dallas. Doctors had told her weeks prior that the child suffered from a severe heart defect, prompting the biological parents to demand that she abort the child due to the risk. Levesque said it ran counter to her beliefs and refused to go through with it. Levesque said the confrontation with the parents caused her to reach out to lawmakers to revise surrogacy laws in the state. She wants protection for biological parents and their surrogates. Levesque said that when Dec. 21 arrived, hospital staff took the baby boy moments after birth. She said to this day, she doesn’t know anything about him.